Today I am wearing Wild Strawberry, which is one of the 32 shades available from the Revlon Long wear color stay nail polish collection. This polish is supposed to be "gel- like" allowing you to have shine and chip free nails for a longer period of time. In fact the advertisements state that you can wear your polish for 11 chip free days. However, if you look at the asterisks on the Revlon ad, you will be directed to text which states "11 day wear if you use the base coat and top coat". It does not say how long the polish will last if you use an alternate base coat and top coat. I decided to play along (kind of) by purchasing the top coat. I applied the polish Saturday night, but I did it so late in the evening that I won't call it day 1. Since Sunday was my official day 1 I will update this post to see how long this lasts, even though wearing the same polish for 11 days may cause me to have a nail polish breakdown. I will say that the polish is much thinner than a traditional gel polish, because of course this color stay is "gel- like" but I do get a measure of shine from the polish. 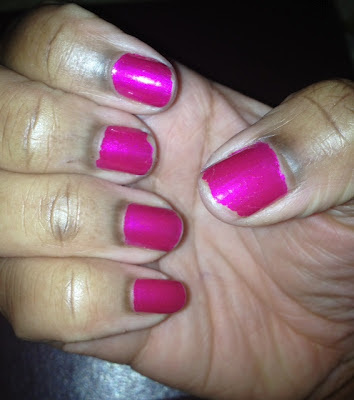 Once coat was enough but I like to be extra so I doubled up on my polish as shown in the picture below. Today is the start of day 2 and that is when I took the pictuer of my nails. This polish has a bit of an iridescent look though you can't really tell from the picture below. Iw ill show this polish on camera soon so hopefully the beauty of this shade will show through. I am normally not a Revlon fan but so far this polish is ok by me and if it does last for a long time, this may become my vacation polish. The polish that I use before going on vacation so that I don't have to travel with bottles of polish and remover. In all honesty, I would probably still carry a travel size of remover and polish just in case. Have you tried the $8.69 (or more in other locations) polish? If so, what are your thoughts? It is not 11 days later in fact, it's only 4 full days later (5 days since I actually applied the polish) and this baby must be removed. Here are two shots, one of each hand at the end of day 4. Clearly my nails have chipped!!! I must say on the right hand you may want to disregard my thumb because that nail broke and as I ripped the rest of the nail off, the polish obviously went with it. However the chips on the finder next to my index finger chipped all on its own. This is not the worse chipping experience that I have had but with this happening on day 4, I knew it was only down hill from there. If you have this product, how many days did it last for you? Also please let me know if you used both the base and top coats by Revlon. In the future, if I see a color from this collection that I just had to have then I would buy it, other than that I wouldn't go out of my way to get this product. 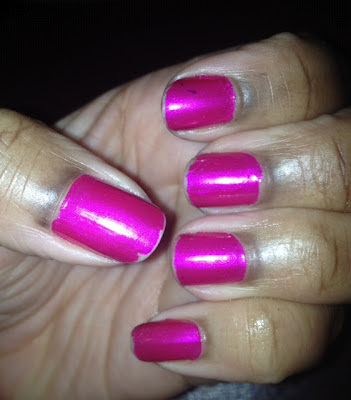 Nail Of The Week- Red??? ?